A decent effort full of solid blues rock and Rod Jackson is a great vocalist, but the album on a whole is fairly forgettable. This album lacks bite and doesn’t come close at all to the danger and anger of GNR, but then, this was just Slash wanting to have fun and killing time until something else came along anyway. 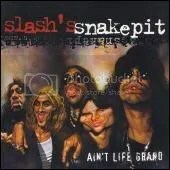 Slash’s Snakepit was okay, but definitely no GNR and not even Velvet Revolver. Surprisingly, Slash’s own talents, in his own band, seem to be downplayed. That only hurts this album.